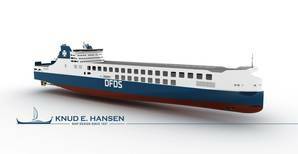 DFDS has exercised an option to order an additional freight ferry (ro-ro) newbuilding from the Chinese Jinling Shipyard. Similar to the five previously ordered large capacity freight ferries, the newbuilding is designed to carry 6,700 lane meters of freight equivalent to around 450 trailers. The new ferries will increase DFDS' operational efficiency in the route networks in northern Europe and the Mediterranean. The first two new ferries are expected to be received in the beginning of next year, the third and fourth in the second half of 2019 and the last two in the first half of 2020. DFDS' fleet extension and renewal program also includes two combined freight and passenger ferries (ro-pax) to be delivered in 2021 for deployment in the Baltic route network. In addition, two ro-ro ferries are being lengthened to increase capacity, and a chartered combined freight and passenger ferry (ro-pax) will be delivered in 2021 for deployment on The English Channel routes.